As you’ll perhaps know from previous newsletters, we had originally hoped to submit the application this summer. 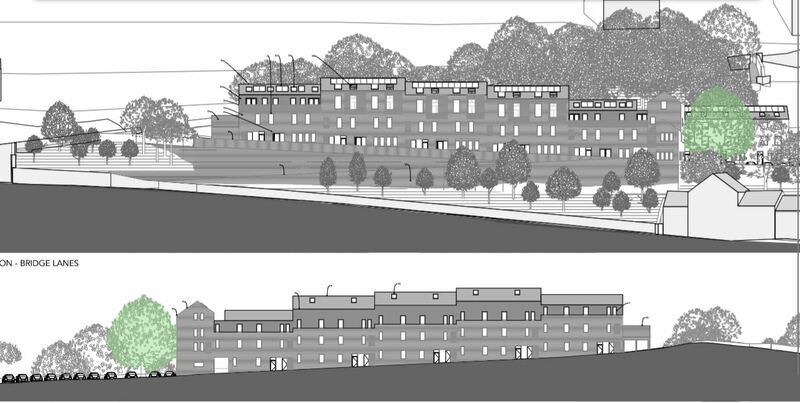 However following our April round of consultations, we were asked by neighbours in Bridge Lanes, Hebden Bridge, to make the development less ‘bulky’. To meet their concerns we have scaled back the development from the original proposal of 27 homes to twenty homes. These will be a mixture of one-, two- and three-bedroomed homes, to be let at genuinely affordable rents to local people in housing need. Our focus is primarily on local younger people, priced out of the housing market. Could we ask you to support our application? The way to do this is online, following the instructions on the portal website. If you haven’t used this before, you will need to register with a password (sorry! ), but we hope you won’t mind doing this to support our work. Comments are one way we can demonstrate to the planners that strong community support exists for the CLT’s work. 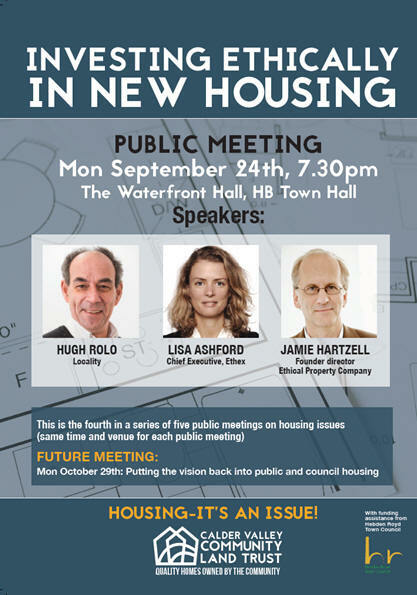 The fourth in our series of five public meetings on the theme Housing: It’s an Issue is coming up shortly, on Monday September 24th. 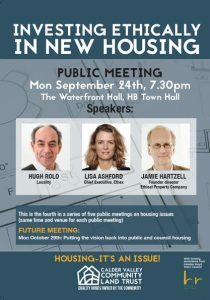 Our focus this time is on how direct investment from within communities can help bring about the sort of new housing which local neighbourhoods want. It’s what we’re planning to do ourselves, of course, when we launch the community share issue later in the year to help provide capital for our Hebden Bridge development. We are pleased to have secured a strong panel of speakers. After working initially in finance in the City of London Hugh Rolo saw the light. He is now Director of Development at Locality, the UK-wide network for community-led organisations (we’re members). Hugh has taken a lead in developing the growth of community shares and other ways of raising social finance, such as crowdfunding. He is also a founding partner and Director of Key Fund, which invests ‘patient capital’ in community enterprises. Lisa Ashford is Chief Executive of Ethex, the not-for-profit platform putting ethical investors in touch with ethical investment opportunities. Ethex has so far helped social impact businesses raise about £50m from investors seeking to invest their money in places which align with their personal values. Our CLT has chosen to use Ethex as our platform for our forthcoming share launch. Lisa is also Director of Goring and Streatley Community Energy, who are developing a hydroelectric scheme on the river Thames. She has a background in community energy in Zambia as well as the UK. Jamie Hartzell is the founder director of the Ethical Property Company, which operates 25 centres which provide appropriate work space and meeting space for around a thousand charities, campaigning groups and social enterprises. The Ethical Property Company was launched in 1998 following a more informal arrangement in Bristol to provide accommodation for co-operatives and groups like the Soil Association, Since then investment from over 1350 shareholders has enabled the Company to operate in nine cities and own property valued in excess of £22 million. The CLT and the Friends of Hebden Bridge Station have been working together, to try to ensure that the future of Hebden Bridge signal box (which is about to be decommissioned) is secured. The box is Grade II listed with many original features from Lancs & Yorks Railway days still in place. However Network Rail has planning permission to remove the stairs and put grilles over the windows once the signal box is no longer needed by them. The CLT and the Friends met Network Rail at the end of last year, to discuss possible options, one of which could be for the CLT to take over legal custodianship of the building (this would be similar to the role we play at the moment in relation to the Fielden Hall in Todmorden). Network Rail at the time seemed very supportive but since then the organisation has proved extremely difficult to communicate with, with letters and emails not replied to. So perhaps we need to demonstrate to them that local people wouldn’t want to see the box boarded up and mothballed. 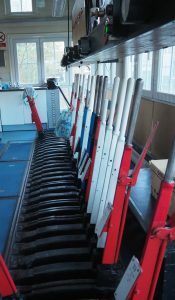 We anticipate launching a campaign shortly to ‘Save Our Signalbox’. More information in due course. We are very close to awarding the building contract for our first development, the six independent living bungalows at Walsden. The tender documents were opened last week, and we are now waiting for our architect and quantity surveyor to undertake the necessary due diligence on the company we expect to choose. CLT trustees will be meeting with them (and with a representative from our partner organisation the almshouse charity John Eastwood Homes) on Wednesday this week. We hope the build will be under way in November.